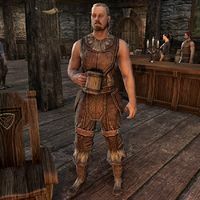 Safrid Tent-Builder is a Nord drunkard who can be found at the Old Goat Inn in Alcaire Castle. When spoken to, he'll say, "I've already been places, don't you see? From the icy reaches of Skyrim to the salty bays of Blackmarsh, I've already seen it. I just want to stay where I am now."